If you’re looking for a safe and natural way to clean you oven, you’re not alone. You don’t really need harsh chemicals and you definitely don’t need to take the “high-heat auto-cleaning” route that will probably trigger your smoke detector! 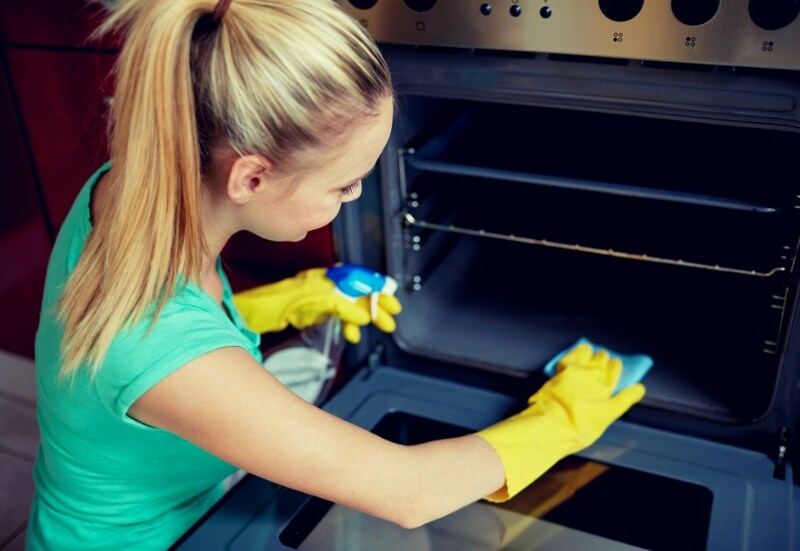 With just a couple of safe items you can find in your home, you can turn your grimy oven into the sparkling appliance it once was. Take out the oven racks: Empty the oven – from the oven racks to thermometer to pizza stone, take everything out. Create a baking soda paste: Mix 1/2 cup of baking soda and 3-4 tablespoons of water in a small bowl. The “right” ratio is one that results in a spreadable paste so adjust accordingly. Spread the paste in the oven: Take the paste and coat the insides of your oven with it. Just make sure you don’t put it on the heating elements! If your oven is really grimy, put on some gloves, they’ll help you really get in there and cover even the nastiest corners in your oven. No worries about ruining your nails! Don’t worry if the baking soda turns brown or gets lumpier in some spots as you rub it in. Pay special attention to really greasy areas. Let the mixture sit for 12 hours: Leave the baking soda coat as it is at least for 12 hours, or overnight if you’re not in a hurry. Clean the oven racks: As you let the baking soda sit in the oven, clean the oven racks. Wipe the oven: Once the 12 hours are up, take a damp cloth and wipe out the coat. Try to get as much of the baking soda mixture out of the oven as you can. You can also use the spatula to scrape off the coat if needed. Spray some vinegar: Now it’s time to use the vinegar. Use a spray bottle to spray the vinegar on all the spots where you can still see some baking soda remnants in your oven. This will gently create some foam as a result of the reaction between baking soda and the vinegar. Wipe it down again: Take up a damp cloth again and wipe out the oven. Remove all traces of baking soda and vinegar foam. You can add more water or vinegar on your cloth as you see fit. The idea is to get your oven all clean and shiny again. Replace the oven racks: Finally, put the oven racks and other things back inside your oven. Congratulations, you’ve learned a very simple and natural way to clean your oven. Enjoy the delicacies you cook or bake in your clean and shiny oven!